You know what I like about this blogging project of mine? The fact that there is always something new to learn. It’s the universe, after all, and I will never ever even begin to contain it. For instance, this is one of the Lampyridae family of beetles, the fireflies, lightning bugs, glowworms. But hold on a moment: this and several of its fellows (yes, the long, elaborate antennae tells us they’re male) were flying in the daylight. This is one of the dark fireflies, day-fliers who do not glow or blink or light up magically. So how can it be a firefly? I mean, besides looking like a firefly? Well, what unites the Lampyridae is that they all have larvae that produce bioluminescence. Yet not all the adults do: and this is one of them, a member of the Lucidota genus. Instead of using light to attractive females, these dark fireflies do it with chemicals; that’s why the antennae are so elaborate, and why they were so busy, waving in the air, searching for female Lucidota pheromones in Van Cortlandt Park. 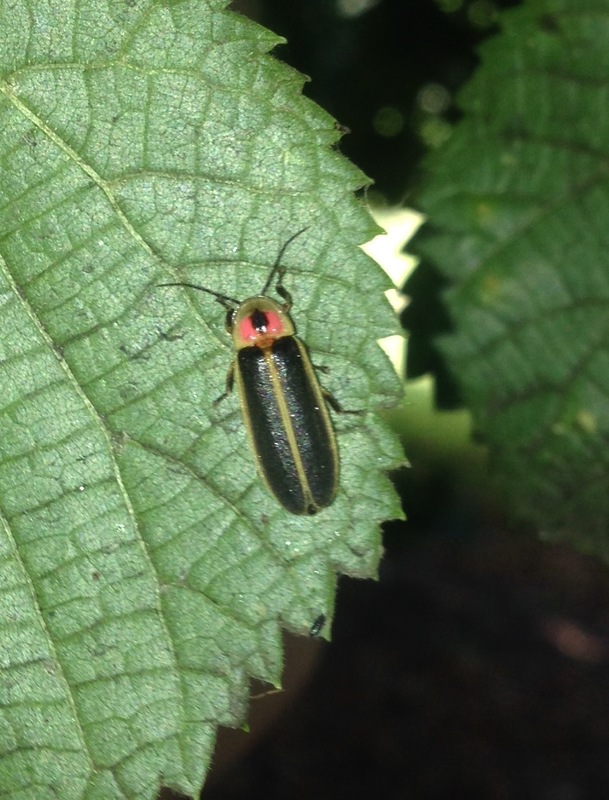 I recently attended a talk by entymologist Sara Lewis, who discussed her study of fireflies and her new book, Silent Sparks: The Wondrous World of Fireflies. Afterwards we all walked into Prospect Park, where a fog after sunset made for wondrous effects. And yes, we saw fireflies, Big Dippers (Photinus genus). And everybody was happy. Here’s one of the night-flying blinky-blink lightning bugs, a Photinus Big Dipper, hiding out during the day. Lewis begins with the near-universal fascination with fireflies, one of those insects are that loved wherever they are found, which is not something you can say for most insects for most people. I still delight in seeing the blink of fireflies at night: there is something awe-inspiring and magical about them. There are some who say that science takes the awe out of the world, but I think this is silly. Knowing that bioluminescence is a chemical process may demystify it, but doesn’t make it any less amazing. The fact that evolutionary processes resulted in such things makes it infinitely more fascinating than the snap of the fingers/tentacles notion of creation by some kind of superior being/presiding genius. I love fireflies, too! It is the sign of Summer that I look for when it gets to be evening. I see them on a certain stretch on my walk home and never fails to delight. The scientific explanation does not take awauyy the magic. I did not know that some did not light up. I am moving across from Van Cortlandt Park so will be exploring that area and looking for fireflies. Sunset Park too expensive, but happy there is a wealth of nature in Riverdale. Bye bye Brooklyn. There’s so much exciting territory to explore in the Bronx! Don’t forget Woodlawn Cemetery. Yes! Wish you leading some walks there! I will have to do a search on your blog for Bronx references. Hope to be getting up there more often in the future! Again, you’ve taught me something I didn’t know (not that there’s any shortage of that). I never knew there were non-blinking species of fireflies, though I’ve seen them flying in the daytime. I had assumed day-flying fireflies were just hanging out during the day. Me too. I figured they had to eat sometime and get ready for their night of romance. Thanks for the information! Fireflies are such an integral part of summer for my family and we have so many wonderful memories of catching them (only for a brief moment and never in a jar) in Riverside Park in Manhattan. I don’t like to anthropomorphize but I consider them very gentle creatures. After standing among them, it wasn’t uncommon to find one trying to hitch a ride on us. Inspections were always required before we went inside! We even found one sitting on the bread rack in a neighborhood supermarket one evening…apparently it had hitched a ride on someone else! That’s a lovely story, Leslie. Thank you. And a good reminder for other readers that fireflies can definitely be found in urban areas as long as their is earth they can live in as larvae. So is Sara (per your “entymologist” description) a hybrid cross between a bug-o-phile entomologist and a wordsmith etymologist?